n the last post, we have shared direct download links of MIUI 8 Global Stable ROM. In this post, we will see how to install MIUI 8 ROM/ Flash MIUI 8 on your Xiaomi device. The MIUI 8 Global Stable ROM is available since 16 August. In this new update, they have fixed several bugs & also various colors options has added. If you are still using MIUI 7 then please go & install the latest version of the MIUI OS to experience new & Awesome features of this ROM. Your device must be on MIUI 7 Global Stable ROM. We are going to install MIUI 8 through flashing process so make sure to take proper backup of your device in case if anything goes wrong. You must unlock bootloader in order to Flash Fastboot ROM through Fastboot Mode. The flashing process through recovery does not work on some Xiaomi devices having Mediatek(MTK) Chipset & Locked bootloader. Please charge your phone well enough to complete this process without power down. 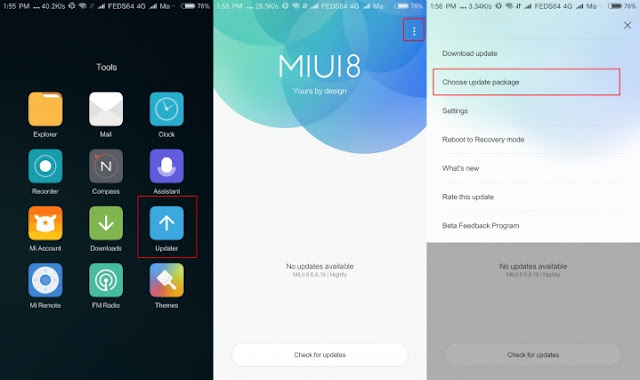 They are three different ways to install MIUI 8 ROM on your Xiaomi phone which are Update using Updater app, Manually download MIUI 8 ROM & Install it through Update app & The last one is Flashing Fastboot ROM through Fastboot Mode. 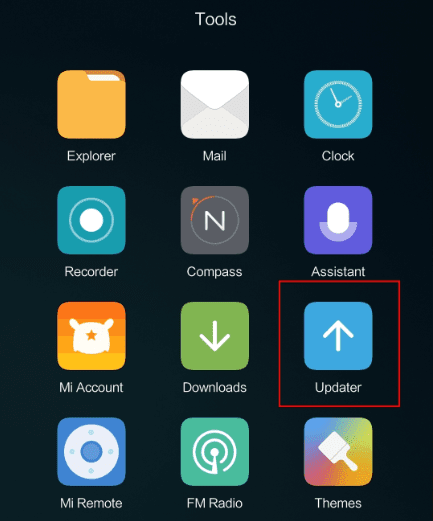 The system update is a really simple method to update your device to the latest version of MIUI 8. You will get an update through OTA. Step 1: Open “Updater” App from your all apps. Step 2: Click on “Check for updates” button. You will see the Update option if there is an update available for your device. Step 3: Click on Update button and Wait till it downloads whole new MIUI 8 ROM. After downloading the ROM click on Install. hat’s it! It will automatically install the update in the recovery. 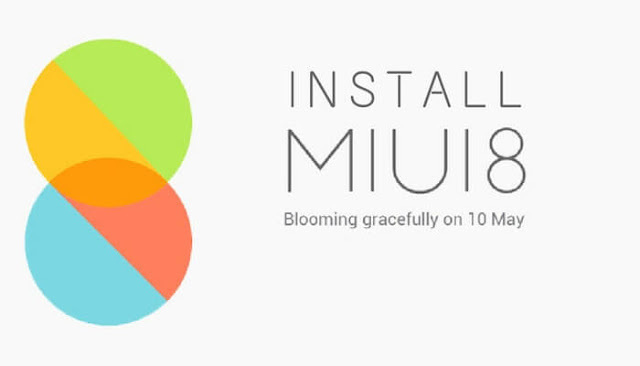 After installation, it will Reboot to latest MIUI 8 ROM. In this method, we will installed MIUI 8 through Recovery flashable file. 1. Make sure that you are on Mi Recovery. 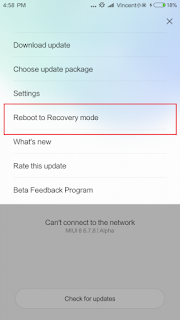 Please install Mi Recovery if you have any installed any other custom recovery like TWRP & CWM. 2. 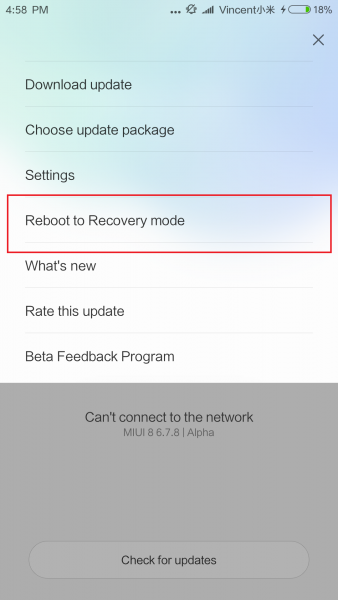 Download MIUI 8 Recovery ROM of your device from there. Place the downloaded ROM in your internal storage of your device. The ROM will be in the .zip file extension. Rename this File to Update.zip. 3. Open Updater app from tools folder. 4. Tap on the three dots from top right corner and select “Reboot to Recovery Mode”. 5. The phone will be in recovery mode now. In Recovery Mode, First any language you want to use.Now, select “Install update.zip to system one” and choose the update.zip file from the root directory and confirm it will start installing the update. You have to wait until it starts installing an update. After successful installation Choose reboot to system option. It will boot your device to the latest version. 1. Download MIUI 8 Global Stable Recovery Flashable ROM First & Rename the downloaded file to Update.zip also place this file in the internal storage of your device. 2. Open Updater app from tools & Choose three dots from right corner. Now, Select “Choose update package” from the menu.
. Go to the folder where you have placed Recovery Flashable zip file & Tap Ok. It will take some time to Verify & Install on a device. After successful installation, it will Automatically reboot your device. That’s it MIUI 8 is installed successfully on your Mi Device. In this method, we will flash MIUI 8 ROM through Fastboot Mode Using Mi Flash tool. For this method unlocking bootloader is mandatory. 1. From Xiaomi Mi 5 & above all devices are coming with a locked bootloader. Refer to our guide & unlock the bootloader of your device using simple steps. Check out (How to Unlock Bootloader of Xiaomi devices using Mi Flash Tool). 2. Download Xiaomi USB Drivers & Install them properly on your computer. 3. Download Mi Flash tool & install this on your Windows PC. If there is any security warning then you can choose Run Option. 4. Download MIUI 8 Fastboot ROM of your device & Unzip the downloaded file on your hard drives. 5. Now, boot your device into fastboot mode using Power on + Volume Down button & Connect your android device to Computer sing USB Cable. For the first time, it will configure USB drivers. 6. Go to the folder where you have extracted ROM Files. Copy the path of the ROM from above toolbar. 7. Run Mi flash tool and Paste the copied URL in the path there. Press Refresh button to check your device is connected or not. If it is connected then it will show device name Something like COM 10. After Success message, you can reboot your device. You will see that latest version of MIUI is installed successfully. First boot will take some time load. Enjoy! That’s it! We have successfully install MIUI 8 on your Xiaomi device. If you face any issue or any type of problem then please do comment below we are always there for your help. Also, Please keep sharing our post on Social Media like Facebook, Twitter & Google Plus.